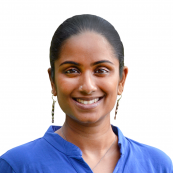 Tahira Thekaekara is the Country Director for India at PYXERA Global, where she leads PYXERA Global’s work to bring together the public, private, and social sectors to find solutions to social challenges and improve the lives of communities across India. Tahira has spent nearly 15 years working in the development sector in India with developmental and environmental organizations, helping them grow and scale up their impact. Before joining PYXERA Global, Tahira spent 10 years at the World Resources Institute, helping set up WRI in India. As WRI India’s Director of Institutional Development, she played a key role in helping WRI grow and scale up their work in food, forests, water, energy, climate, cities and transport and establishing the organization as a significant player in the environmental space in India. Over her ten years with WRI India, she was instrumental in growing the organization from 3 to over 100 staff and in setting up offices in Mumbai, Bangalore and Delhi, working on strategy and scaling up fundraising and operations for WRI India. Before joining WRI India, Tahira worked at GiveIndia, an online philanthropy platform that seeks to put individual donors in touch with transparent and accountable NGOs, eventually aiming to create a giving culture where Indians donate 2 percent of their income each year. She headed the team responsible for conducting the due diligence process on NGOs listed on the GiveIndia website, and was part of the team that advised high net worth donors and corporates on their selection of projects, and philanthropic investments to maximize their social returns. Tahira grew up surrounded by forests in the Nilgiris, in South India, where her parents work with the Adivasi community. Tahira has always been extremely interested in issues related to the environment and ecologically sustainable life styles, and is is also interested in issues related to child rights. Tahira has a Bachelor's degree from St. Xavier's College, Mumbai and a Master's degree in Anthropology from the University of Pune.